Team Motul Pirelli Suzuki's Matt Moss has completed a clean sweep of the Pro Open class at this weekend’s double-header round of Milwaukee presents the Terex Australian Supercross Championship at Hidden Valley Raceway. Motul Pirelli Suzuki’s Matt Moss has made it two from two to open the Milwaukee presents Terex Australian Supercross Championship, following round two in Darwin this afternoon. Moss won the premier SX-Open main event, while Serco Yamaha’s Luke Styke broke through for his first SX-Lites main event victory of the season today. The opening SX-Lites main event commenced proceedings with Gavin Faith (Carlton Dry Honda Racing) slicing his way past Luke Styke (Serco Yamaha) and holding on for the victory. Ryan Marmont (Raceline Pirelli Suzuki) completed the top three. SX-Lites heat two was a thriller, with Brenden Harrison (Choice Motorsports KTM) narrowly fending off determined fellow KTM 250 SX pilot Kale Makeham (Tune Tech Racing KTM), while Luke Arbon was third (Serco Yamaha). Rookie Kirk Gibbs (Motorex KTM) scored a popular first heat race win in the SX-Opens, topping Jake Moss (Campbell Mining Suzuki) and defending champion Jay Marmont (Monster Energy Kawasaki). All three worked they way past early leader Lawson Bopping (CDR Yamaha). Round one winner and series leader Matt Moss (Motul Pirelli Suzuki) was a convincing winner in SX-Open heat two, heading home Americans Josh Hill (InsureMyRide/Hart and Huntington/DPH Suzuki) and Weston Peick (Carlton Dry Honda). Luke Styke celebrates his SX-Lites main event victory. Image: Grant Reynolds/FiftySix Clix. Styke won the SX-Lites main event in dominant fashion, leading from wire-to-wire in the again reduced 12-lap final. He headed round one winner Faith, while Marmont was his consistent self to complete the podium. “I can’t thank the Serco team enough,” Styke said. “They have the best engines and best package in the pits. I’ve had a taste of the win now, so I think it can get easier now and we’ve got four weeks to prepare. Faith, now tied on points with Styke, was disappointed after working his way through from fourth, but unable to make inroads on Styke in the closing stages. The round marked Marmont’s maiden podium aboard the RM-Z250, the former champion fending off Luke Arbon (Serco Yamaha) for the position. Behind Arbon and rounding out the top five was Makeham, while yesterday’s third place podium finisher was Dylan Long (KTM). Kiwi Kayne Lamont (Choice Motorsport KTM) was seventh, while Nicholas Sutherland (TM Racing Australia), Taylor Potter (Honda) and Daniel McInnes (Yamaha) filled the top 10. 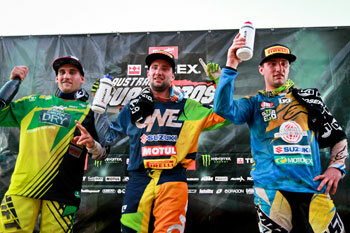 Styke, Gavin Faith and Ryan Marmont made up the SX-Lites podium. Image: Grant Reynolds/FiftySix Clix. The SX-Open final was a captivating end to the evening, with Moss working his way back from third in a composed ride. He was third on lap one and then moved to second on lap six when early leader Gibbs went down. From there Moss remained calm, eventually putting an assertive pass on Peick during the 10th lap of 15 and then going on to easily win by 5.520 seconds. “I saw them tussling a bit, I sort of knew Gibbsy was going to make a couple of mistakes, and then Peick was pulling away a little bit but I kept my cool,” Moss said. “I saw the opening, tried to pass him on the triple and I think that rattled him wondering where I was. Then I pounced to the inside. Peick challenged Gibbs in the early stages and pressured him into falling, then led for four laps before coming under attack from Moss. Gaining comfort by the lap, he was satisfied with the runner-up result tonight. “We had a lot better day today,” said Peick, who usually rides a Suzuki in the US. “We made a lot of changes to the bike for today and everything seemed to come together better. Jake Moss was a fighting third in another incredible performance, working his way through the field from seventh on lap one. Not quite a Moss/Suzuki 1-2, but a strong effort from the twins. 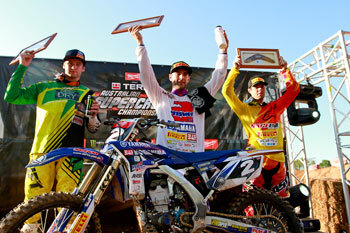 Matt Moss headed Weston Peick and Jake Moss on the SX-Open podium. Image: Grant Reynolds/FiftySix Clix. Gibbs recovered to a credible fourth after inching away from Supercross teammate Daniel McCoy in the closing stages. Another to suffer from a slow start was defending champion Marmont, ending lap one in eighth and only managing the climb to sixth. Kade Mosig (CDR Yamaha) was next best in seventh after working his way past the fast-starting Hill, while Bopping soldiered through the effects of glandular fever for ninth. Victorian Honda privateer Tim Vare was 10th. Matt Moss now leads the championship with a perfect 50 points, ahead of Jake Moss on 42 and Peick on 36. 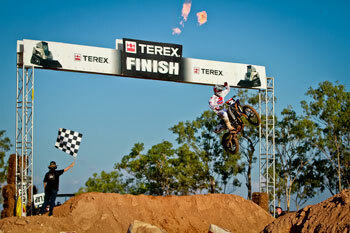 The Terex Australian Supercross Championship will continue at Mount Gambier in South Australia on Saturday, 12 October.